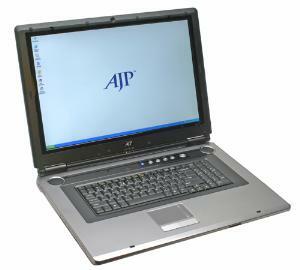 AJP M590K-H is a 19-inch widescreen SLI (scalable link interface) notebook with Duo VGA. AJP M590K-H features two NVIDIA GeForce Go 7900 graphics cards with 256MB DDR3 VRAM, 19″ WSXGA+ (1680×1050 resolution) widescreen LCD, AMD Athlon Turion 64 processor, DDR 400MHz RAM, S-ATA hard disk, dual layer DVD rewritable optical drive, built-in wireless LAN 802.11b/g, built-in Bluetooth, built-in 56K fax/modem, built-in Gigabit Ethernet, built-in 1.3 mega pixel digital video camera, built-in 4-in-1 Card Reader (supports MMC/SD/MS/MS-Pro), built-in 4x speakers and sub-woofer, optional hybrid TV Tuner is available for real time digital or analog TV watching, and comes with 3 years warranty. The laptop runs on Windows XP Home edition.